Like most things in life, it’s best to do a little research before signing on the proverbial dotted line. This wisdom comes in handy when you’re in the market for a lawn care business to take care of your property in the Cleveland and Columbus, Ohio regions. What should a lawn care company know? There are all kinds of folks out there who claim that they can mow a lawn. These businesses are called mow and blows because that’s exactly what they do: They’ll mow your lawn and blow the grass clippings off your property for a couple of bucks. 1. Comparing Apples with Apples - Do some comparison shopping – You have a plethora of lawn care companies to choose from in Cleveland or Columbus, Ohio, from the guy with a pickup and a mower, to a local business with certified lawn technicians, to the big name companies that we all know about through their abundant advertising. 2. Don't Sacrifice Licensed Technicians to Save Money - If you want to hire a local lawn care company beyond the mow and blows, but you don’t want to roll out big bucks for the impersonal service of a big-name company, make sure that the local company you choose employs certified technicians. And don’t settle for the first lawn care company you come to either. 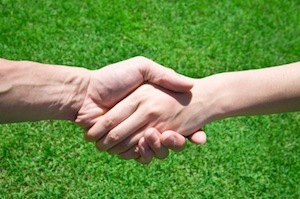 Instead, ask two to three lawn care companies to visit your property and talk to you about their services. 3. Be Aware How Much Nitrogen They Use: For a typical Ohio lawn, a reputable lawn care company will use 3 – 5 pounds of nitrogen per 1,000 square feet of lawn per year. 4. Know when they’ll apply phosphorous and potassium to your lawn – Since every lawn is different, your lawn care company should be willing to test your soil first before applying any phosphorous and potassium to it. Extra applications of these two nutrients won’t kill your grass. Yet, you don’t want to pay for something that you don’t need. It is a good idea to use phosphorous and potassium as additives if you typically want all grass clippings removed after each mow. 5. Make sure that they’ll apply the right type of fertilizer at the right time – For a review, nitrogen comes in two types: quick-release and slow-release. There are times when quick-release fertilizer is fine to use, but there are times when it could damage your lawn if used at the wrong time of the year. For example, using quick-releasing nitrogen on your lawn, right before you put your lawn to bed for the winter, puts it at risk for snow mold. 6. Be wary if a lawn care company guarantees you a problem-free lawn - This is common sense. Nothing is perfect or problem-free. There are many factors that go into a healthy lawn, including the weather. Your lawn is affected by the weather if there’s a lot of rain in spring through fall or if there is a drought from July through September. No lawn care company can claim to predict the perfect lawn season to anyone. 7. Check out a lawn care company’s reviews – Do some research on the internet about the lawn care companies you’re thinking about hiring. Check out: Angie’s List, Better Business Bureau, Consumer Report’s, Consumer’s Checkbook, Google Local, and Yelp. And ask your family, friends, and neighbors who they’d recommend for a good lawn care company. While it’s always a risk to hire a lawn care service for your Cleveland or Columbus, Ohio property, you can always have the upper-hand in your decision-making by applying the above criteria before you sign a contract. Looking For More Hiring Tips? We Have a Guide For That! Hiring a lawn care company in Cleveland and Columbus may not seem like a daunting task, however with so many to choose from it is sometimes difficult to tell them apart. That's why the minds at Weed Pro have put together their best suggestions and poured them into a easy to follow Lawn Care Hiring Guide. The best part of this guide is that it's yours ABSOLUTELY FREE by clicking on the button below!